With funding from The Kavli Foundation, the think tank will bring together some of the major researchers in exoplanetary science – arguably the most exciting field in modern astronomy – for a series of annual meetings to address the biggest questions in this field which humanity could conceivably answer in the next decade. Tremendous advances have been made in the study of exoplanets since the first such planet was discovered around a sun-like star in 1995 by the Cavendish Laboratory’s Professor Didier Queloz. Just last month, a potentially habitable world was discovered in our own neighbourhood, orbiting Proxima Centauri, the nearest star to the sun. However, there are still plenty questions to be answered, such as whether we’re capable of detecting signatures of life on other planets within the next ten years, what the best strategies are to find habitable planets, how diverse are planets and their atmospheres, and how planets form in the first place. With at least four space missions and numerous large ground-based facilities scheduled to become operational in the next decade, exoplanetary scientists will be able to detect more and more exoplanets, and will also have the ability to conduct detailed studies of their atmospheres, interiors, and formation conditions. At the same time, major developments are expected in all aspects of exoplanetary theory and data interpretation. In order to make these major advances in the field, new interdisciplinary approaches are required. Additionally, as new scientific questions and areas emerge at an increasingly fast pace, there is a need for a focused forum where emerging questions in frontier areas of the field can be discussed. “Given the exciting advancements in exoplanetary science now is the right time to assess the state of the field and the scientific challenges and opportunities on the horizon,” said Professor Andy Fabian, director of the Institute of Astronomy at Cambridge. The think tank will operate in the form of a yearly Exoplanet Symposium series which will be focused on addressing pressing questions in exoplanetary science. One emerging area or theme in exoplanetary science will be chosen each year based on its critical importance to the advancement of the field, relevance to existing or imminent observational facilities, need for an interdisciplinary approach, and/or scope for fundamental breakthroughs. About 30 experts in the field from around the world will discuss outstanding questions, new pathways, interdisciplinary synergies, and strategic actions that could benefit the exoplanet research community. 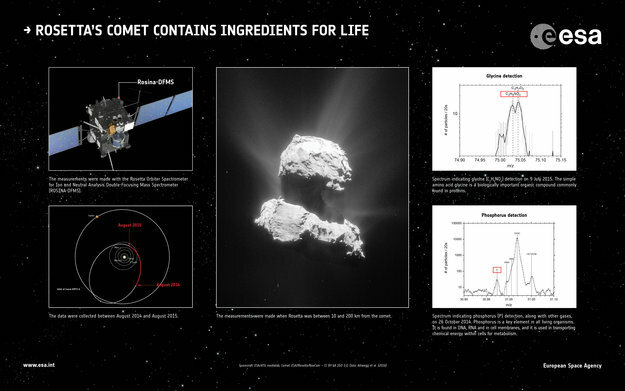 Rosetta’s comet contains ingredients for life.